My name is Sara and I am from South Carolina, USA. 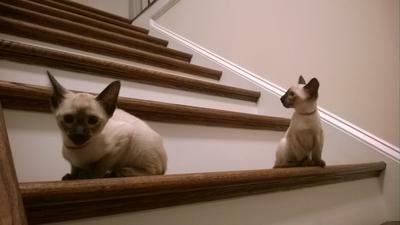 I have two Siamese girls, Lily and Talulah, and I fall more and more in love with them every day that passes. I've been wanting to write you for some time now, to tell you how much I enjoy your site and newsletters. I actually found your site after I brought Lily and Talulah home in August 2014. My husband and I have always been cat people and we had two shelter cats for a very long time before getting our girls. About a year before we lost our second shelter cat (the first had passed away a few years prior), I saw an Animal Planet show with a segment on Siamese cats (Cats 101), and just fell in love. 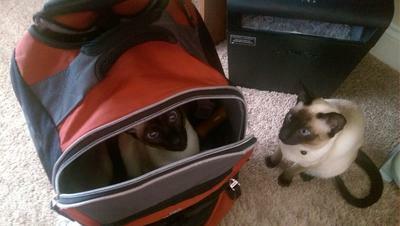 I knew that when the time came for us to get new kitties, we would choose Siamese. However, at that point, I still had no idea of just how special they really are. Lily and Talulah are both so affectionate and loving (and even those two words seem like understatements). They are each rambunctious in their own way. Lily, whom we understand was the smallest of the litter, is our little adventurer. For being such a small girl, she's never had a small attitude. If it can be gotten into, she's already there, or she's already been there and done that long ago. I am absolutely certain that every paw print we've ever cleaned off of the fish tank was Lily's. I'm also convinced that she STILL walks all over the balcony bannister whenever I'm not home (gives me a coronary every time I see it - one part has a 15ft drop). She is our little daredevil for sure. Then there is our precious Talulah, aka Drama Queen. She is so emotional and loving. When she wants attention, she wants it. Period. It does NOT matter what you're doing, or how you might otherwise be occupied. I am fortunate to be able to work from home a few days each week, and she frequently goes "keyboard flopping" while I'm working (when my arms are stretched out typing she jumps up on my desk, walks to my arms, and quite literally flops over, leaving me no choice but to catch her). She also likes to run and flop, especially when we've each been out for a while and first come home. She will run ahead of one of us a few feet, and then flop down on her side, meowing and "rolley-polleying" the whole time. When Talulah does this, I really can't help but think of the proverbial drama queen, raising a hand to her forehead and sighing dramatically just before a faint ... my husband jokingly calls it the vapors. She has also never met a mirror that she didn't like. She frequently hops up on our dresser and just stares at herself. Cute just isn’t the word! I confess that I probably didn't do enough research before bringing the girls home. Not that I've been disappointed in any way but I just didn't realize there were so many Siamese rescue shelters. I can see how their antics can be overwhelming to those who just expect a "regular" cat, but I cannot imagine bringing a cat home and then sending it away. I'm not judging anyone who ever needs to make that decision, of course, I just don't think it's something I could ever do. I do know, sadly, that the day will come when I won't have Lily and Talulah any more (I'm hoping that's AT LEAST 20 years from now), and when that happens, I will definitely look at Siamese rescue shelters before going to another breeder. With that said, I must say that we had a great breeder who is extremely responsible, and it's very obvious that she loves her sires/queens deeply. She's also very choosy, and personally places each cat. However, since bringing my girls home, I have realized just how many of these special little creatures are given up, and I know I will find great joy in rescuing when that day comes. 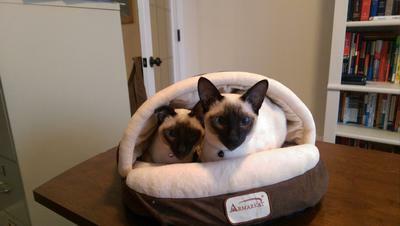 Thank you so much, Sara, for sharing Lily and Talulah's story with us. They certainly sound like great characters as so many Siamese are. They really do have their own different and independent personalities. Your comment about Talulah being a Drama Queen made me laugh so much! The decision on whether to get kittens or rescue is a very individual one. There are of course many cats with Siamese coloring in shelters and rescues and they all deserve a second chance on life. But as long as you choose a responsible, registered breeder (which you obviously did), kittens can bring an enormous amount of fun and joy into your life and if you get two from the same litter they are great companions for each other. Dottie, best Christmas gift ever!